Our company began supplying the Neutral Grounding Resistors which use the past air for insulation (Neutral Grounding Resistor: With abbreviation NGR or NR) to the former Nihon Hassoden Co..,Ltd. in 1930. Since then, we have been expanding activities and are now supplying resistors to Japan's ten major electric power companies and exporting large quantities to various other countries as well. The voltage range of our neutral grounding resistors is wide, up to 161kV, and their reliable performance is highly appreciated by our clients. The purpose of doing neutral point grounding is, because high voltage and long-distance power lines cause many obstacles, though there are no troubles even if neutral point grounding isn't performed by low voltage and a short distance power line. The main troubles are as follows. - For the abnormal voltage of the time of single line-to-ground fault, insulation of equipment and a railroad track is harmed. - A breakdown continues for a long time because it is impossible to detect of earth faulting. - Induced voltage or electric current is caused in the communication line which is produces at the time of power line breakdown, the equipment for communication is damaged because of this and it is harmful to the communication work person. 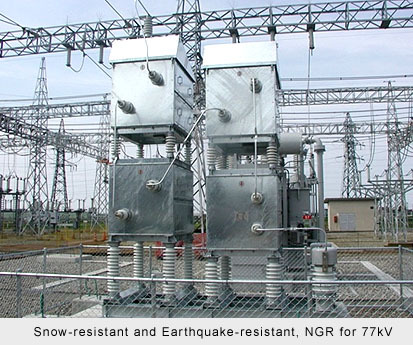 The Neutral Grounding Resistor which this corporation has produced use the resistant common configurations which grounds the neutral of the generator and the transformer by the resistance of 100Ω~1000Ω because our country land is narrow and it's easy for electromagnetic induction failures to occur. The Neutral Grounding Resistors of this corporation, we'll design and make the most suitable resistors based on rich backing data if you show the conditions like as the voltage (insulation), electric current (heat), resistance (resistant element) and vibration (earthquake).